Any of our past readers will know that Domino is a top model when it comes to posing and wearing dresses. More recently, I have just been adding hats and jewellery digitally to Domino, but in the not-too- distant past she would don real dresses and model them at leisure. I was always amazed at her natural affinity for it. It was something she truly seemed to enjoy. However, now that she is older it has become a less frequent affair --mostly, just when company comes on the odd occasion. 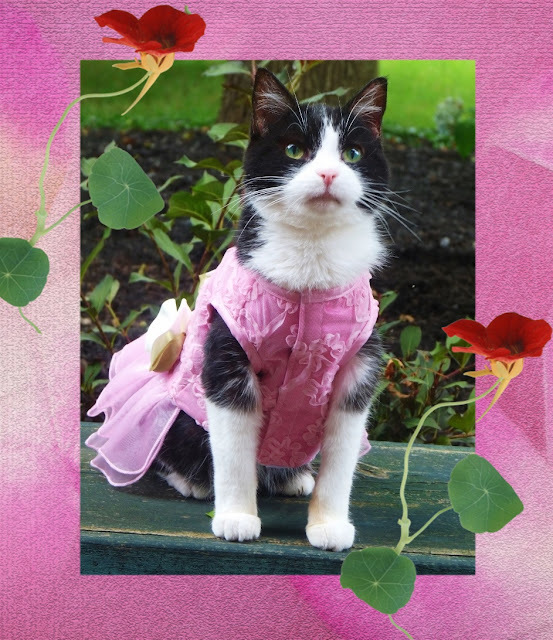 So for you who are newer to this blog, here are some of Domino's finest modelling moments. This is Domino in a pretty peach number with three-tiered tule skirt. 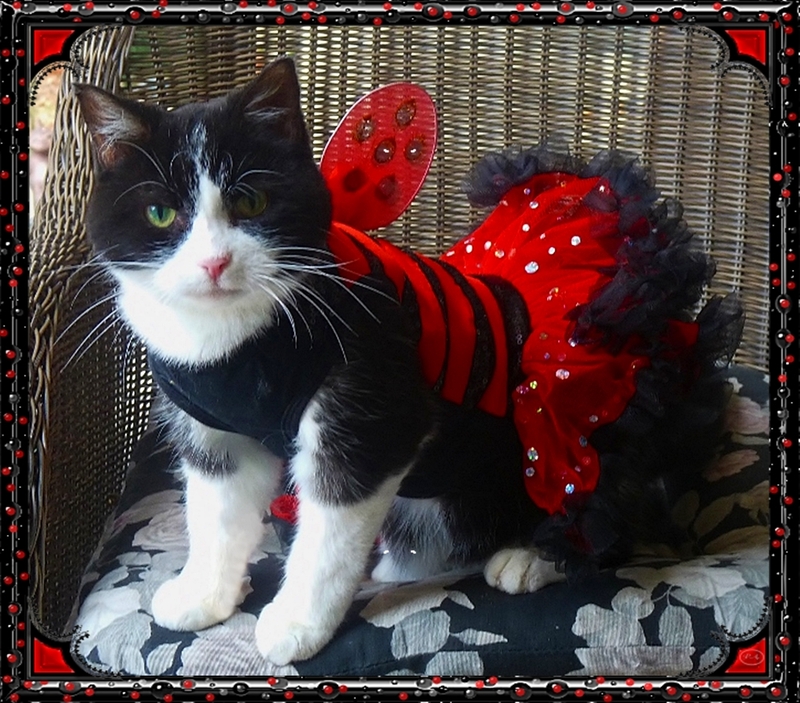 Here she is in a red bee outfit which she wore for Hallowe'en that year. 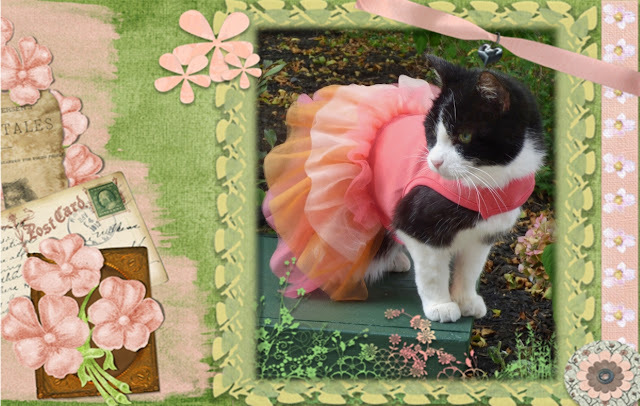 This pretty pink dress was her birthday outfit on September 1st a couple of years ago. It has gorgeous ivory roses across the waistline at the back. This is what I call Domino at her most subLIME, trotting around in the garden on a summer's day. This is one of Domino's best poses. It is completely natural. The only doctoring was the flower that I put by her ear. 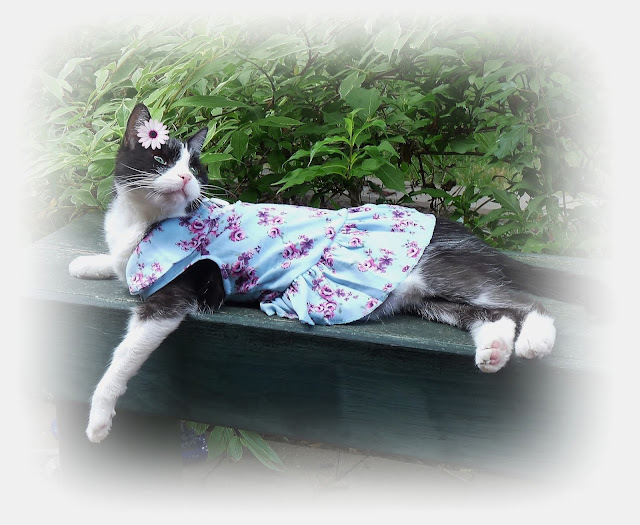 The dress is light blue with mauve flowers. It has quite a large collar and a ruffled skirt. And finally (for now), this is one of my all-time faves! 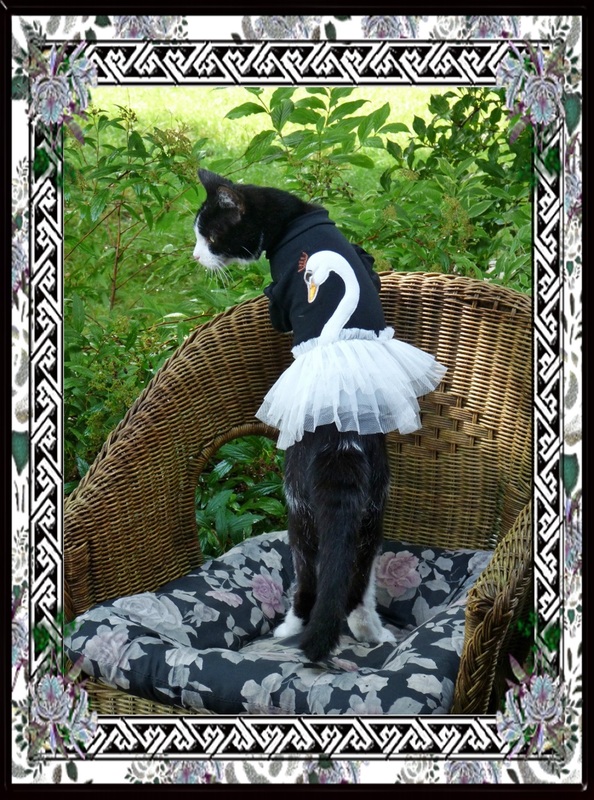 Domino is wearing her ballet outfit. As you can see it has a black top with a white swan embroidered on it, and a little white tule skirt. I must admit that I placed Domino in this standing position on the chair, but she stayed there for a good long while letting me take different shots while she changed her head position, but remained on her toes. What a pro! That's all for now, but we'll revisit more of Domino's modelling career from time to time. We hope you have enjoyed the show. And this is an avatar I customized for Domino and then drew in the dress. 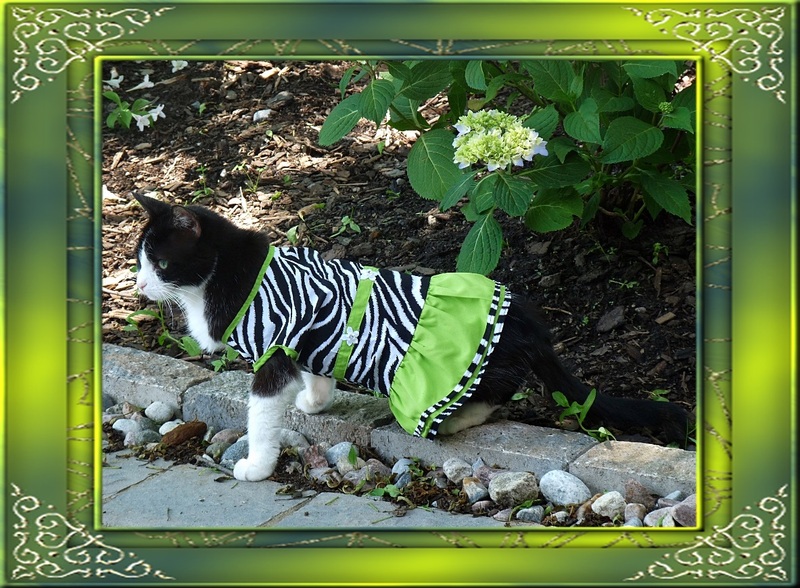 Domino, you sure do look stunning and are such a fashion gal! These are amazing outfits! Domino is really a fashionista! I can relate because I love wearing clothes. I feel special when my human puts something on me.